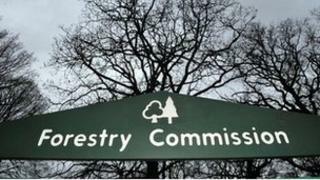 Image caption The Forestry Commission is set to change under proposals from the Independent Panel. An independent panel which was set up to review the future of publicly-owned woodlands in the UK cost £700,000 to run, the BBC has learned. The panel, set up in 2011, concluded in its final report that forests should be held in a trust and not sold off. It was set up after a ministerial U-turn on plans to sell off woodlands. The government is to issue a response to the report in 2013 but has already said it will accept the recommendation not to sell off woodlands. More than 500,000 people had signed an online petition to protest against the plan. The costs of the panel were obtained through a Freedom of Information request show that the total spent was approximately £700,000 - within the allocated Defra budget. Administrative costs to support the 12-member panel were £400,000, with two posts being funded by the Forestry Commission and Natural England. The panel published an interim report in December 2011 with the final report being published in July. The cost to produce the report was £12,000. Panel members were not paid but were reimbursed for travel costs. A total of £27,000 was claimed between March 2011 and July 2012. A spokesman for the Hands off our Forest campaign group in the Forest of Dean - which led opposition against any sell-off in Gloucestershire - said: "The money spent on the panel will be worth it - as long as the Government listens."